It’s that time again…Chinese New Year! Okay, so it’s not for another month but it’s difficult not to get excited about the biggest celebration on the Chinese calendar, especially because it means there’s going to be dragon dancing, red money packets, fireworks, beautiful red lanterns, and most importantly, a boat-load of delicious food involved. What could be better? Chinese New Year comes as a most welcome relief by all who embrace it. For many, it’s the warm, glowing, mouth-watering light at the end of a cold, dank tunnel that is the January blues. It’s the time to kick the dumb diet and let yourself feel better by stuffing your face with a platter full of dumplings. 2013 is the year of the Snake. New year falls on Sunday 10th February. If you were born in the year 1917, 1929, 1941, 1953, 1965, 1977, 1989, 2001, or 2013 you are a Snake! Congrats. Snakes are popular, charming and determined, and although they are prone to over exaggerating everything, they are the object of desire among those who know them. Seductive, and irresistible. Food is one of the most important parts of Chinese culture, if not the most important, and the types of food eaten are symbolic of age-old traditions that continue today. Chinese New Year carries a menu full of traditional dishes that symbolise a celebration of the new year. We have compiled our favourites for you to make your own Chinese New Year FEAST! In a large bowl, combine the Pork, Mushrooms, Water Chestnuts, Spring Onions, Ginger, Sauces, and Wine. Season with salt and white pepper. Mix together well. Place the Pork filling onto the centre of each Won Ton Pastry in teaspoon sizes. Fold the wrappers in half so that the points meet to form a triangle, and squeeze the open sides together to make pleats along the edge. Heat 1 tablespoon of Vegetable or Groundnut oil in medium sized frying pan over a medium heat. Add the dumplings and place them side by side, so that they fill the base of the pan. Fry for 2 minutes then turn the heat down and pour 100ml water in and cover. keep an eye on the dumplings and keep turning them to make sure they don’t stick to the bottom. 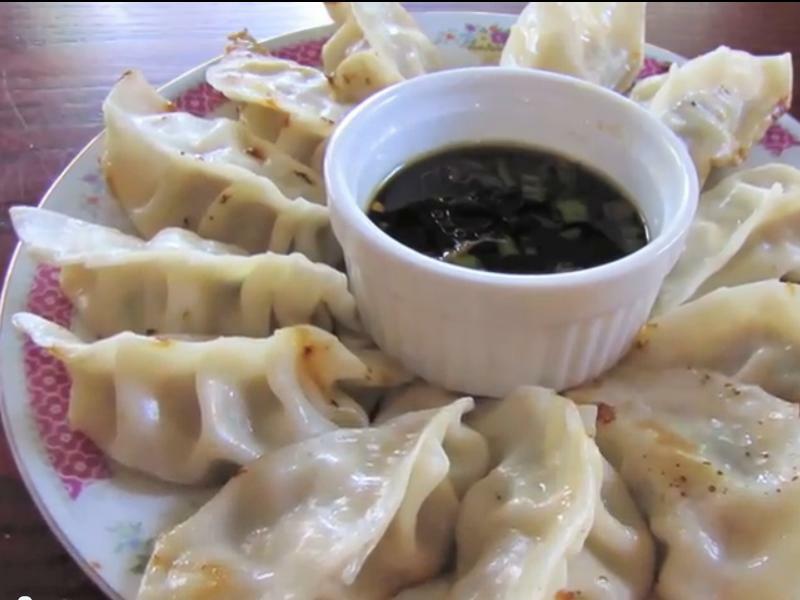 Cook until the water has dissolved, and the dumplings have absorbed the water all the way through. Add more water if they need cooking longer. Serve on a big sharing plate with a dipping sauce of either sweet chilli sauce or Dumpling sauce: 4 tablespoons rice vinegar 4 tablespoons light soy sauce. Alternatively, if you don’t have the time or patience to make dumplings by hand, we stock a huge variety of ready made dumplings with lots of different fillings that are quick and easy to make!